By famous artists of famous people!! "In the future, everyone will be famous for 15 minutes" so said the greatest pop artist of all time. Andy Warhol created an incredible trend, a need, a desire for self promotion and was able to use this desire in others. This page (as does this whole site!) Documents some of the most famous pop art around. It contains some truly iconic images and has an excellent array of different artists offerings. 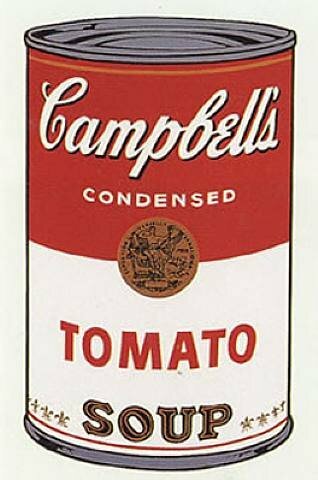 Andy Warhol and his Campbells Soup can has be reprinted over and again and has remained and iconic and incredible image over time. You have to ask why this might be? What is it about the image that makes it so amazing? Warhol reproduced this in a range of colours and prints and there are a number of versions available today. There are, some would argue, far better images out there today that people can hang on their wall, but something about the can is enduring. Andy Warhol had a real habit of creating iconic imagery from the most every day of items. Not easily redplicated! 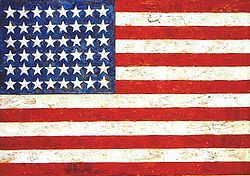 Then there are images like Jasper Johns and his American Flag, which is an enduring and clear symbol of representing the US spirit during the middle of the 20th century. Again, an iconic famous pop art piece that makes a huge and lasting impact. There are pieces of art that have a huge impact on the culture of time and this is without a doubt one of the most important pieces. If you want to find out more about these famous pop artists or any others, then please use the navigation to the left. Happy Pop Arting!